This probably won’t come as a great shock, considering my propensity for the more human side of the Marvel Universe than the cosmic, but Thor: The Dark World is the ‘phase 2’ film I have been looking forward to the least. While I enjoyed the first instalment, it doesn’t go on my all time favourites list with Iron Man, The Avengers, and Captain America. I’ve never been particularly interested in Asgardians – I prefer technology over magic – so I guess I wasn’t really expecting The Dark World to be my ‘thing’. So, while I saw Iron Man 3 on opening day, I waited until I had a day off work to see Thor. I didn’t show up at the theatre until the trailers were nearly over, and almost missed the opening scene. That’s not to say I was completely blasé – I was still bouncing in my seat with excitement by the time the Marvel logo appeared. I think my husband was struggling not to groan at my predictable enthusiasm and excited chatter which, I’ll be honest, was mostly due to seeing Sif, and Darcy Lewis back on screen. Spending as much time on the internet as I do, it’s hard to avoid being spoiled for huge releases such as this, but I managed to stay almost entirely in the dark over the few days between release, and my trip to the cinema. I had seen a few mentions of events, but without context, had no idea of their impact. This lack of spoilers, combined with the mostly middling to negative responses I’d seen glimpses of from critics, meant I had limited expectations. If anything, I guess I kind of expected it to be a bit crap, which is why I’m so pleased to be able to give The Dark World heavy praise. What this movie is, is fun. It’s filled with great battle sequences, clever dialogue, and some seriously unexpected moments of hilarity. Actually, over all, the entire film is really, genuinely funny. I laughed all the way through, sometimes on my own thanks to my warped sense of humour, and sometimes with the rest of the audience when the more overt jokes dropped. While the scenes on Asgard, Vanaheim, and Svartalfheim are pretty spectacular, it was the Earth based sequences that really had me hooked. The entirety of these take place in London – a refreshing change from events continually returning to the US – and mostly involve Jane, Darcy and Darcy’s ‘intern’ (his name’s Ian, okay?) running around London doing science. Eric Selvig is back as well, and has some of the funniest moments in the film, despite (or thanks to) the fact he’s still a bit messed up after the Battle of New York. The Earth based scenes having a real potential to be dull and tedious, but they actually contain a more exciting, wonder-filled tone than those off-world. Add to this, Kat Dennings’ (Darcy Lewis) excellent comic timing, and Stellan Skarsgård’s manic and bewildered portrayal of Dr. Selvig, and I found myself wanting to rewind and watch some scenes over and over. The plot itself isn’t anything special, but it’s serviceable, and does its job in helping bring together a film that’s more about the characters than the actual storyline. It really boils down to bad guy wants the thing, good guy doesn’t want the bad guy to get the thing, good guy gets other bad guy to help, humans save the day while good guy and bad guy beat the crap out of each other, which isn’t a bad road to go down. In fact, the simplicity of the core plot actually helps offer more expansion for asides throughout the movie, to offer more insight into the characters, and what could be coming next in this universe. Malekith and his dark elves aren’t particularly dastardly villains, and are really just an allegory for modern-day religious warfare. Doing what you believe is right because of an antiquated or skewed view of the universe. Christopher Eccleston struggles to act beneath the layers of makeup, and comes across as reasonably uninteresting, but then I don’t believe he was ever really supposed to be the centrepiece of this film. He’s really more of a plot device than a character, and I’m completely okay with that. The return of Loki will be welcome to most, and Tom Hiddleston is really at his best here. I’m not one of the legions of Loki fans who are ready to kneel for him, but I can give credit where it’s due. Hiddleston feels like he’s toned down some of his over-the-top, borderline scenery chewing antics, which made me enjoy his performance a lot more this time around. I was disappointed by the sparing use of Sif and the Warriors Three (or Warriors Two – Hogun is glimpsed twice, on his home realm), but with a film as brief and packed full as this was, I can see why they weren’t featured more prominently. One good thing came from this though, and that’s the omission of a love triangle between Sif, Thor, and Jane, which would have been a heavy weight around Dark World’s neck. The strength of The Dark World’s secondary characters, is what made me go from pleased to thrilled, though. Between the science crew of Selvig, Darcy, and Ian, the quiet and menacing strength of Frigga, and a couple of moments of perfection from The IT Crowd’s Chris O’Dowd as Jane’s date Richard, there’s plenty to keep the viewer interested between fight sequences and Loki’s smarmy one liners. I also appreciated the strength displayed by all the women in this film, and the focus placed on them, even though it’s supposed to be a movie about Thor. There’s also a brilliant (sort of) cameo that was so unexpected, the entire audience dissolved into excited exclamations and almost uncontrollable laughter. On the technical side of things, the film succeeds on almost every front. It looks stunning, the visual effects are great, and the score fits nicely with the overall tone. The costuming is almost flawless, although at some points Odin and Thor’s armour looks a little like it was on sale for $99 at The Warehouse after Halloween. The only real downer for me was the 3D, which did little to add to the depth of the scenes, and at times was a bit fuzzy in places. As it was a post-production conversion, this wasn’t really surprising, and I don’t think it was necessary. As a whole, Dark World is a very successful film, that proves a movie doesn’t need to have a strong villain or revolutionary plot to be thoroughly entertaining. The action sequences are spectacular – particularly the final battle, which starts to make your head spin after a couple of minutes, the characters are interesting and multi-faceted, and there’s a sub-plot that you could be forgiven for forgetting about until the very end. Stay right to the end of the credits to catch the very last from the science crew – there’s two credit scenes, so you could easily think the teaser for Guardians is the final word. 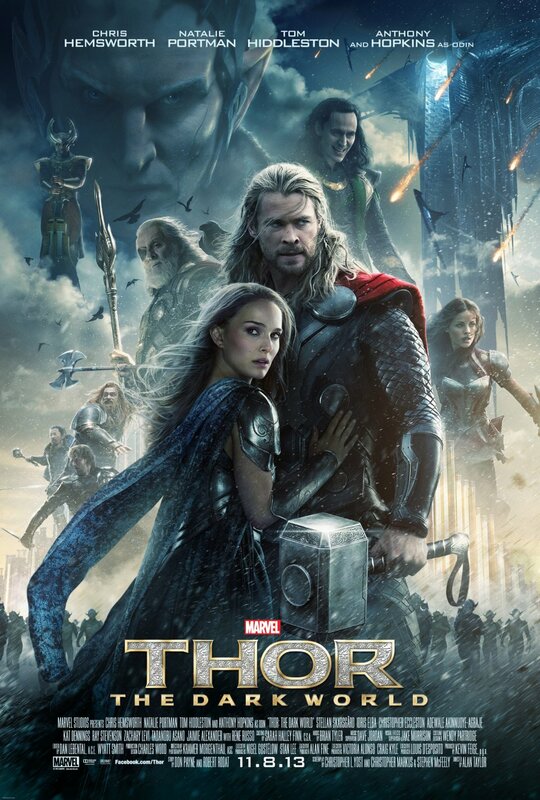 Thor: The Dark World is yet another example of Marvel doing its version of the comic book superhero genre right, by not making superhero films. Just as the Iron Man films are action comedies, Captain America: The First Avenger a war movie, and the first instalment of Thor a fish out of water story, The Dark World sits firmly in the realm of sci-fi and fantasy, never once feeling like it needs to be defined by the word superhero.